TALLAHASSEE, Fla. — In an ongoing effort to cultivate a campus that is advancing education, the campus of Florida State University set Thursday as Day of Discovery and Dialogue. 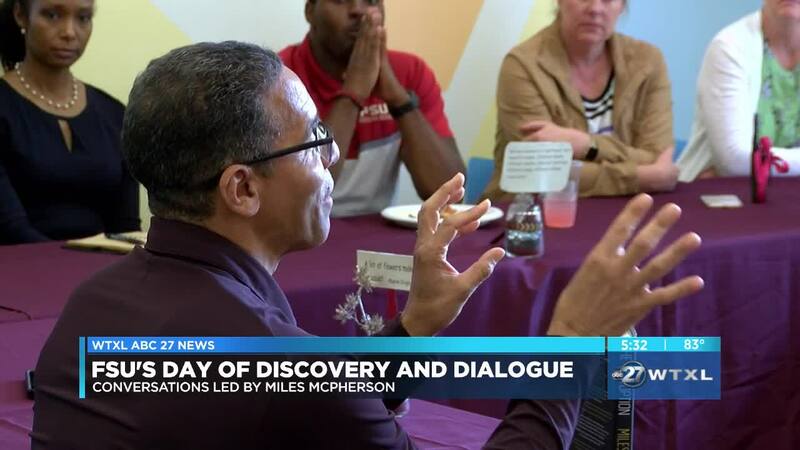 Former NFL Star and motivational speaker Miles McPherson led conversations based on his new book "The Third Option: Hope for a Racially Divided Nation." He wrote this book to honor what different cultures have in common. "I talked about the fact that the culture was made for right handed people, and if you're right handed, you don't realize the advantage you have over left handed people," said McPherson. "Your desk at school, made for right handed people. It's easy to get right handed golf clubs, right handed catcher's mit, and if you're left handed you have to go to three or four extra stores, and it's similar to the cultural advantage people have when you're in the majority." McPherson said diversity needs to be honored and although racism is present, he wants a world where people see color and appreciate it.